Today I tasted my first pupusa and promptly fell in love. The national dish of El Salvador takes the shape of a thick corn tortilla stuffed with cheese, beans or pork. Corn turns up in many of my favorite foods as it exudes comforting homeyness. My friend Julie, who has lived in Richmond for 20 years, has been telling me about her little neighborhood gem, La Bamba Taqueria, which has been there longer than she has, and I finally got her to take me there for lunch. 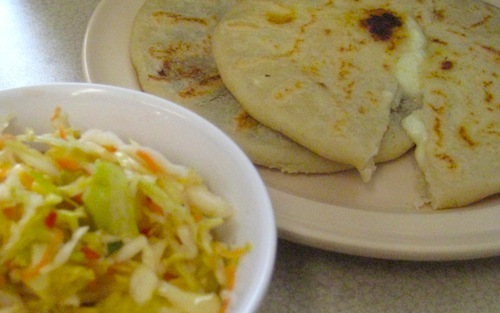 Pupusas’ history reaches back hundreds of years. Implements for making them were discovered in the archeological site Joya de Ceren (like a Salvadoran Pompeii) where around the year 600, a volcanic eruption buried a farming village. No human remains were found, so it seems that people were able to flee the lava in time, but they left behind utensils, ceramics and even half-eaten food. One reason pupusas are so good at La Bamba is that they are made fresh right in front of you. You can watch the women patting the masa dough into a pancake, adding the filling, rolling it up in a ball and then patting it flat again. They throw the pupusas on the grill and heat each side till lightly browned. 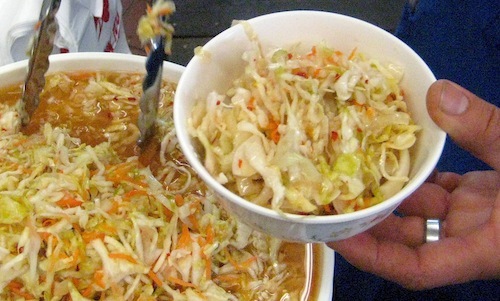 The traditional accompaniment curtido, is a tangy mix of cabbage, carrots, onions, chilis and vinegar that is slightly fermented. The melty cheese oozing from a warm corn patty topped with cool crunchy slaw is a heavenly marriage of textures. And the best part: you eat pupusas with your hands. This entry was posted in El Salvador, gluten-free food and tagged Curtido, La Bamba Taqueria, Pupusa, pupusas, Salvadoran food. Bookmark the permalink. 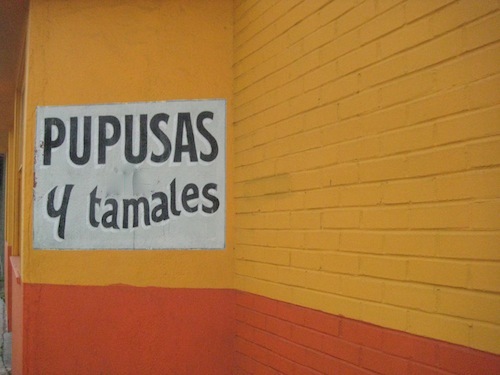 Oh, I love pupusas too. There’s a Salvadoran restaurant across from West Oakland BART and also one on Fruitvale that make them. But sadly, I tend to stay away from them for weight-watching reasons. There are all these delicious categories of food (fried chicken! burritos! dim sum!) that I ate wantonly when younger and now try to approach with caution. Sigh. Ilana, you are a better woman than I am — in terms of self-control — especially with these quests to try new ethnic foods. Oh well, at least I have also fallen in love with Zumba dance classes. Maybe they balance out. These Pupusas look unbelievable good! I think a trip to Richmond is in order to give them a try. They also look like they would be Gluten-Free…an added bonus. Thanks for finding these and getting the word out.